Antonín Langweil’s model of Prague (1826-1837). Credit: Joker Island. Source: Wikimedia Commons. I spent a weekend in Prague quite recently, more than seven years after my first visit to the city, and, as far as I could tell, little had changed in the intervening period, which is not something you could say about cities like London or Berlin. Prague, like Paris and Vienna, is a chocolate-box city. Its medieval heart, designated by UNESCO as a World Heritage Site in 1992, has been more or less captured like a fly in amber since the middle years of the twentieth century. There are precious few intrusions into this frozen historic scene, and even the gargantuan Intercontinental Hotel, opened in 1974, appears to make an effort to fit in with its older neighbours. All of which means that, for the returning visitor to Prague, signs of change must be sought through other means. For example, I encountered technological changes at street level, in the form of microphones attached to the sides of the heads of tour group leaders, and the earpieces worn by the tourist zombies that blindly followed them, receiving instructions directly into their brains. In the city’s squares, more technological change confronted me in the form of herds of Segway riders, who meandered aimlessly, menacingly, through the pedestrian crowds, causing me to reflect on a past in which the Segway was trumpeted as a world-changing innovation destined to transform our urban landscapes, in stark contrast to the present time, in which they have become the exclusive domain of sightseeing fools who are far too easily parted with their money. Müstek Metro Station, Prague. Author’s own photograph, October 2015. I found further evidence of change underground, along the platforms and stairwells of the city’s Metro system, the earliest stretches of which are monuments to Communist engineering and aesthetics, an austere yet elegant celebration of the state’s embrace of technological progress. At Müstek, for example, the platform walls and curved ceilings give me the impression of standing inside a giant Dalek. Beyond such examples though, if one is searching for evidence of profounder change to Prague’s cityscape, a visit to see the Langweil model in the city museum is a must. The model was constructed from wood and paper by Antonín Langweil (1791-1837), a librarian employed in the city’s university library, between the years 1826 and 1837. Painstakingly accurate to the smallest detail (Langweile, incidentally, means tediousness in German), the model records every window, gable and backyard in the city’s castle, old town and lesser town. During the years of its construction, Langweil’s model was widely exhibited. It appeared in exhibitions of Bohemian industry staged in Prague castle, and received attention from newspapers journalists and writers in far-off Vienna. Ill-health prevented Langweil continuing work on his model in 1837 and, when he died shortly thereafter, his family bequeathed his work to the National Museum. Unfinished Strahov monastery in Langweil’s model of Prague, c.1836. Source: Wikimedia Commons. What makes Langweil’s model interesting to present day audiences is that, of the more than two-thousand buildings featured in the model, approximately half have been demolished or remodelled since Langweil’s death. Most significantly, Langweil’s model shows the Jewish Quarter (Judenstadt) as it was when it was still a ghetto, cut off from the rest of the city and almost exclusively inhabited by the city’s Jewish population. 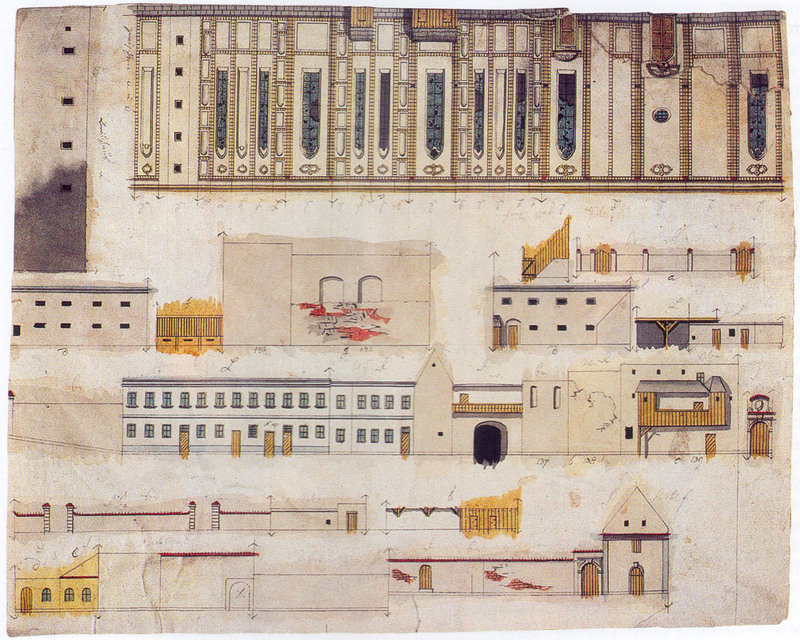 But the landscape of Langweil’s Jewish Quarter was on the brink of tremendous change. The Patent of Toleration, issued by the Holy Roman Emperor Joseph II in 1782, paved the way for the integration of the Hapsburg territories’ urban Jewish communities into wider society. In Prague, the boundary lines between the Jewish ghetto and the surrounding area were becoming blurred. 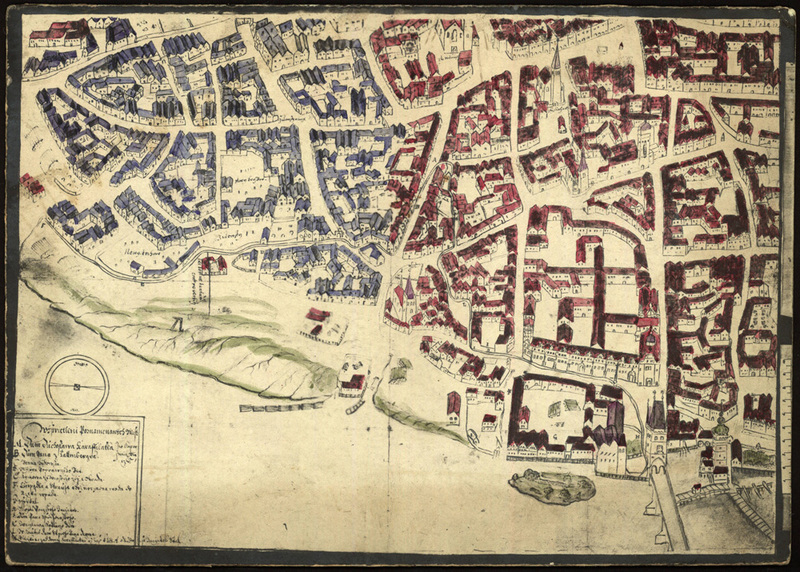 Plan of Prague, 1665. The old town in shown in red and the Jewish Quarter in blue. Source: Wikimedia Commons. Nowadays, the guidebooks and other tourist guides tend to refer to this part of Prague as the Jewish Quarter once again, rather than Josefstadt. Its surviving synagogues and cemetery have become major visitor attractions in the city. The grim events of the twentieth century, combined with our present culture of memorialisation, have shifted the emphasis away from the earlier acknowledgement of religious tolerance, towards a reaffirmation of the area’s historic religious identity. Eli Valley, The Great Jewish Cities of Central and Eastern Europe. Lanham: Rowman & Littlefield, 2005. 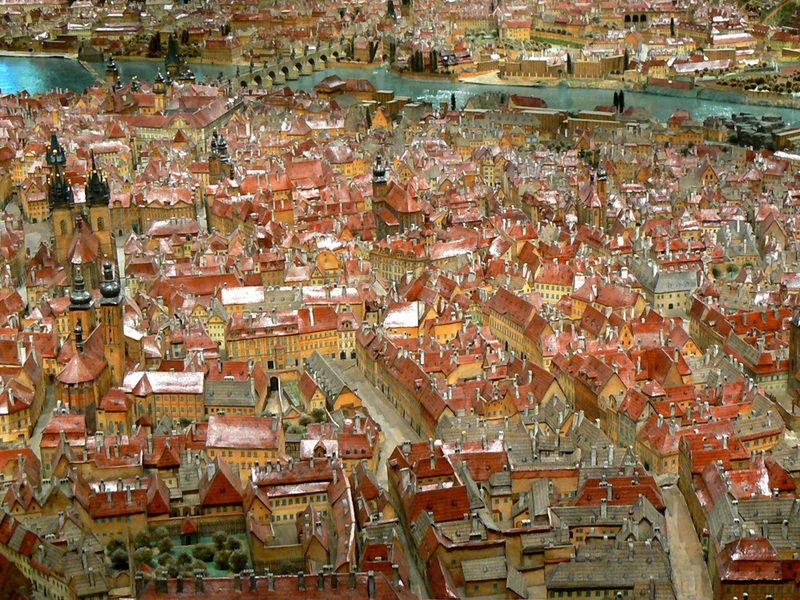 Langweil’s Model of Prague – Homepage. Prague: City of Prague Museum, 2009. http://www.langweil.cz/index_en.php, accessed 22/10/15. Baedeker’s Southern Germany and Austria, including Hungary, Dalmatia and Bosnia. Karl Baedeker, 1891. Austria-Hungary, with excursions to Cetinje, Belgrade, and Bucharest. Karl Baedeker. 1911. Julius Max Schottky, Prag, wie es war und wie es ist, nach Aktenstücken und den besten Quellenschriften geschildert. Volume 1. J G Calvesche Buchhandlung, 1851.